The Island Bay cycleway is a 1.7 km pair of cycle lanes along both sides of The Parade between Shorland Park and Wakefield Park. The Parade is the most direct route connecting many local amenities and is therefore the best location to provide for people on bikes. - don’t provide well for bus stops. Because The Parade is flat and wide, dedicated bike lanes separate from traffic are ideal – this is great because they’re one of the safest forms of on-road cycle infrastructure. There were several different options for the cycle lane layout along this stretch of road. This included two one-directional lanes running in the direction of cars, and a single two way lane. Council engineers found that two separate bike lanes on either side of the road would be the safest and most feasible for the location and this was confirmed by public feedback. The new cycle lanes use parked vehicles to physically separate people on bikes from moving traffic. This is a very common method of separation overseas that makes cycle lanes significantly safer and more appealing to ride along. The consequences of a collision involving a person on a bike are greatly reduced because motorised traffic is not involved. The likelihood of a collision involving a person on a bike is also reduced because according to the Ministry of Transport only 1 in 3 car journeys actually has passengers. People riding bikes in a cycle lane will also generally be riding slower and will have plenty of time to slow down or stop if necessary. The new cycle lanes include a 0.6m buffer marked between parking and the cycle lane to further minimise the risk of collisions between people riding bikes and passengers entering or exiting cars. In busy areas the buffer space is wider and adjacent to mobility car parks it is 1.2 metres wide. The narrowest combined section of the cycleway is 2.0m (1.4m bike lane plus 0.6m buffer) and the widest combined section is 3.0m (1.8 bike lane plus 1.2m buffer). The narrowest section represents around 20% of the whole route. Some people think that the new cycle lanes won't be wide enough to allow people riding bikes to over-take each other but this isn't correct. Anywhere along the cycle lanes where there is a gap between parked cars (for instance where there are driveways or empty car-parks) creates an opportunity for a faster person on a bike to move out and over-take a slower one. For example, in the picture above there is plenty of time and space for one person on a bike to over-take another before encountering a parked car. Just about every block on the cycleway has at least one opportunity for over-taking "built-in", where there are two or more driveways adjacent to each other. 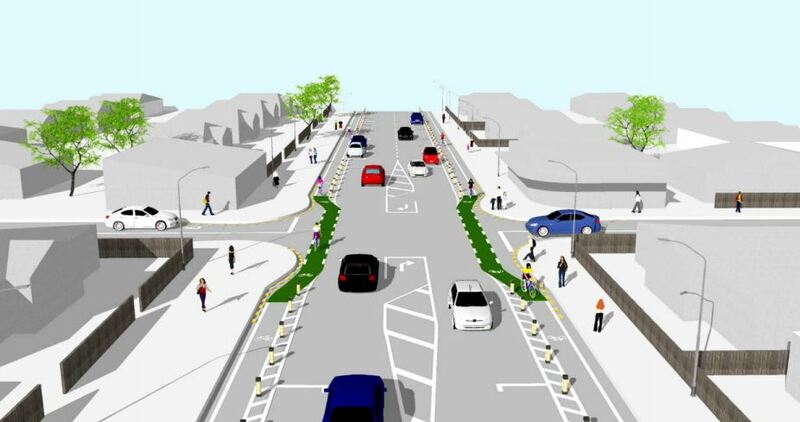 Most of the space for the separated cycle lanes will be gained by replacing the painted median in the centre of the road with a standard centre line. Apart from losing the median strip motorised traffic and pedestrians will have the same amount of space available to use as they do now. The picture above shows the southern section of The Parade where there are bike lanes currently marked on the road. There are no bike lanes marked in the northern section and the median strip is approx. 3 metres wide. The median strip under the proposed option will vary slightly to accommodate minor variations in the total width of the road . Every bus stop along the new route will have a specially designed Dutch style bus stop bypass which diverts people riding bikes around the back of the bus-stop rather than being squeezed between a stopped bus and passing traffic. People on bikes ride up a ramp to footpath level and pass behind the bus shelter on a dedicated cycle lane on the footpath. The bus shelter sits on an “island” with the cycle lane running behind it. Bus passengers will step off the bus onto the island where they will wait until it is safe to cross the cycle lane onto the footpath. Where possible, the footpath will be widened to include a dedicated cycle lane on the footpath and an “island” for the bus shelter. Where the footpath can’t be widened, there would be carefully marked shared space where people riding a bike must give way to pedestrians. Bus stop bypasses are new for Wellington, but have been used in Christchurch and are used overseas. The Parade’s existing intersections don’t provide well for people on bikes. Cyclists and other road users have complained that the cycle lanes stop in the areas where they are most needed, i.e. where there is turning traffic at intersections. 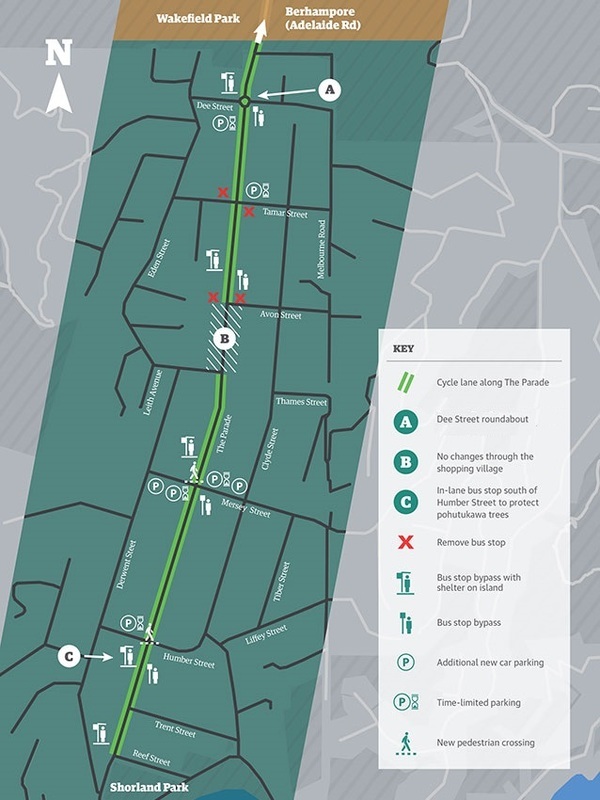 To address this cycle lanes will be painted through the intersections of Trent, Humber, Mersey, Medway, Avon and Tamar streets to make sure the cycle lanes are continuous along the higher speed (50km/h) sections of The Parade. All of these intersections will have Stop signs on the side streets. Intersection corners at the cross roads of Humber, Mersey and Tamar streets will also be built out to the side streets to shorten crossing distances for pedestrians and encourage greater care from left turning vehicles. The key difference for intersections with kerbside cycle lanes is that people riding bikes approaching an intersection will need to move out from behind the parked cars to be near the traffic and ride through the intersections conflict points in a position where they can be easily seen. So they can be clearly seen, some on-street parking will be removed on the approaches to intersections to minimise the risk of a sudden merge between a vulnerable road user and a vehicle. This also means that the sight lines for cars entering The Parade from side streets will be significantly improved. Existing right-turn bays will be retained at these intersections, as on balance they are a preferred facility to keep for safety reasons. There will be no cycle lanes through the shopping village. The area of the Island Bay shops is currently covered by a 30km/h speed limit. This lower speed area means that people on bikes and in cars can share the available road space with reasonable safety. New speed cushions will also be introduced on either side of the shopping village to reinforce the speed limit. The two existing pedestrian crossings will be raised to footpath height to help calm the traffic even further. While there are still issues with bikes passing cars reversing from angled car parking, no changes have been proposed to this parking arrangement yet. Usage will be monitored to see if it's necessary. As part of the overall upgrade four new pedestrian crossings will also be added near Dee, Humber, Mersey and Tamar streets. These will make The Parade significantly nicer and safer for pedestrians as well as people on bikes. 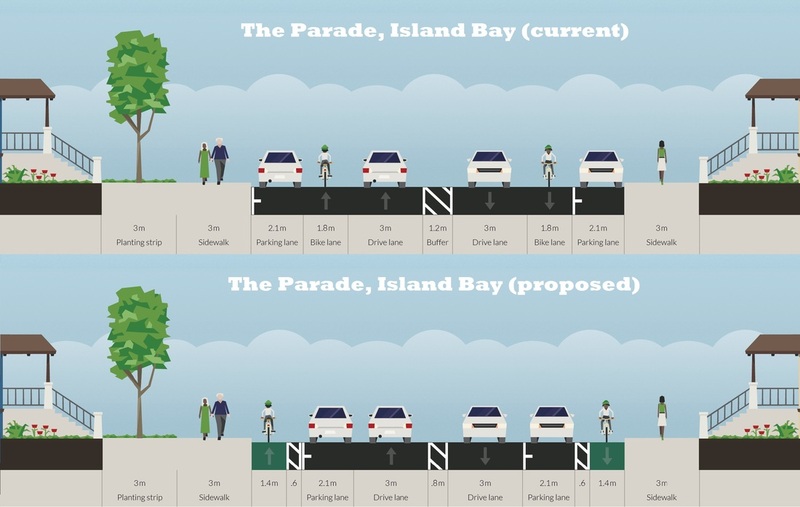 Acknowledgement - the text and pictures on this page are largely adapted from various Wellington City Council reports on the Island Bay cycleway.